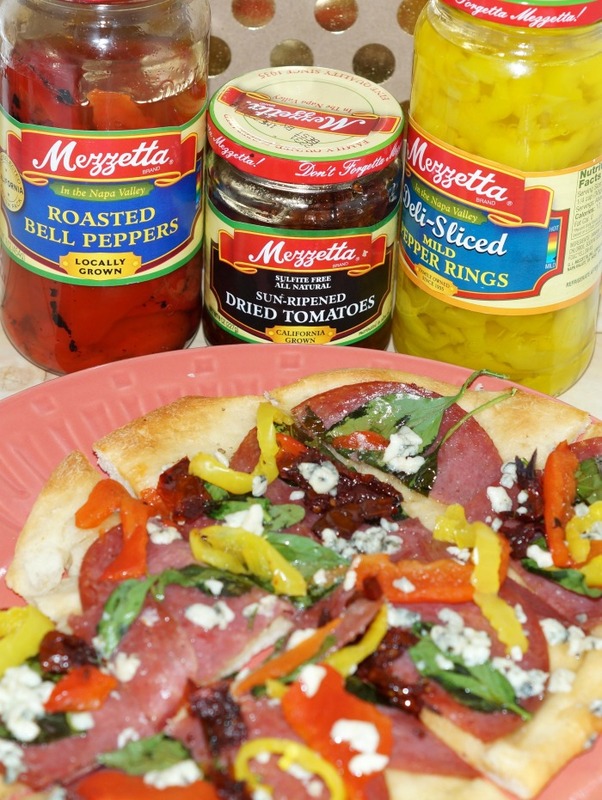 Special thanks to Mezzetta for sponsoring this Rustic Tuscan Flatbread Pizza. The holidays are upon us, and we’re going to more and more places, and hosting more get togethers. Whether we’re popping over for a small, impromptu get together, or we’re hosting a housewarming party, there is a need for snacks and light eats. The Rustic Tuscan Flatbread pizza is a perfect hors d’oeuvre. Looking for something a bit more hearty? Pair the Rustic Tuscan Flatbread pizza with a salad for a light meal. 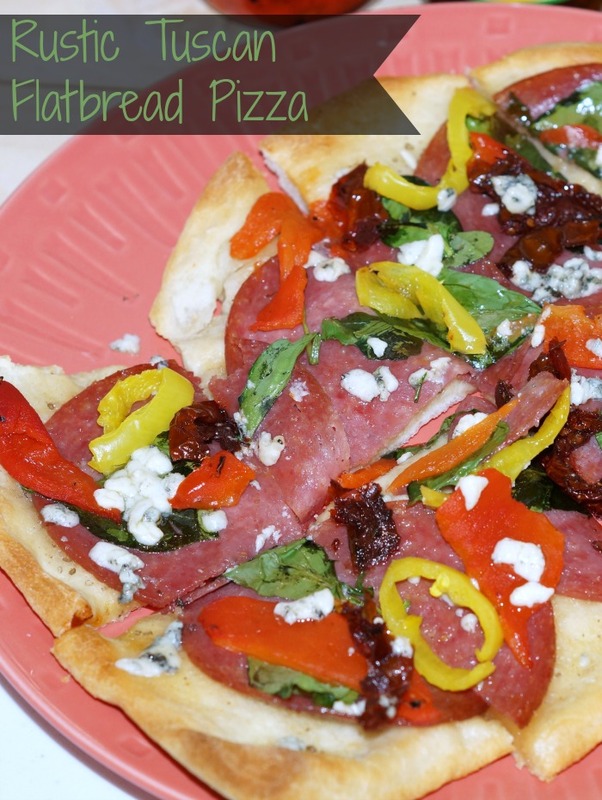 A rustic flatbread pizza that is quick, easy, and delicious. Loaded with veggies and salami instead of a heavy red sauce. This recipe makes 2 pizzas. premade pizza dough - We used a refrigerated one in a can. Spread the pizza dough out. Divide in half. Set one half to the side. Spread out the other half on a cookie sheet or flat baking dish. Repeat with the other half. Sprinkle dough with garlic powder, to taste. Bake for 8-10 minutes, or until it's a lovely golden brown. Lay out salami on dough. Use about 8 slices per pizza. Top the salami with spinach sprinkled all over. About 1/2 c per pizza. Top the spinach with red pepper strips, pepperoncini, and sun dried tomato slices. Put back into the oven, and bake for another 5 minutes or so. Long enough to get everything warm and toasty. Take out of the oven, and drizzle lightly with olive oil. Sprinkle with blue cheese. Let cool about 5-10 minutes. Cut into about 8 pieces and serve. What makes this Rustic Tuscan Flatbread pizza so special? It’s all the delicious flavors that come from the Mezzetta products. With delicious gourmet products ranging from sun dried tomatoes and roasted red peppers to the most amazing olives that you’ve tasted – there’s something for everyone! Even better – their items are grown and packaged in the Napa Valley of California. With the questions of where does our food come from, you have to love that!! In fact, I had to stop myself from loading up my Rustic Tuscan Flatbread Pizza with too much good stuff.